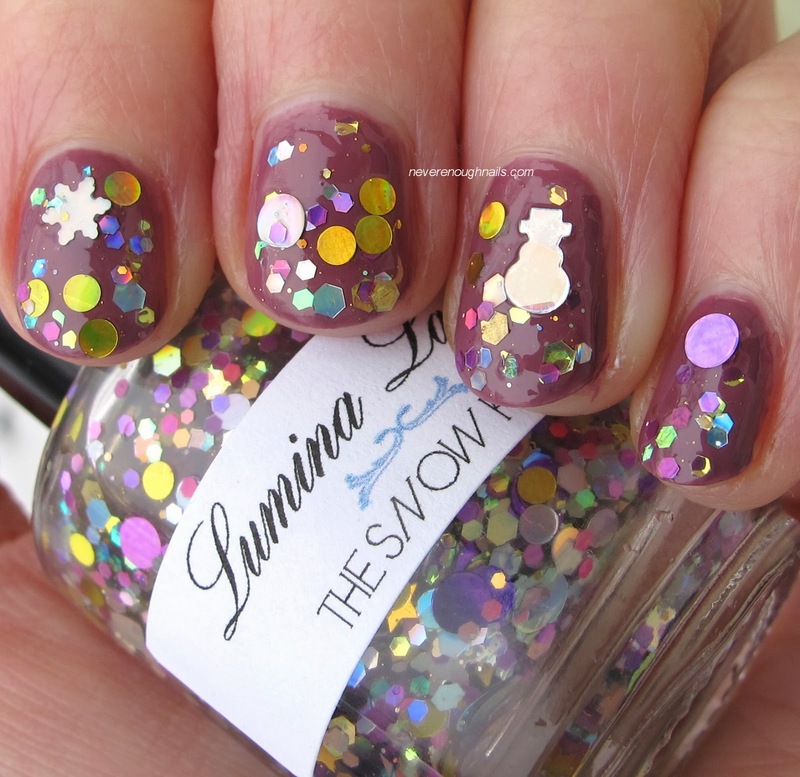 The indie polish makers have been killing me lately with their holiday offerings, Lumina Lacquer in particular. I have two of this year's holiday Lumina Lacquers to show you, and I really wish I could have purchased about 4 more! 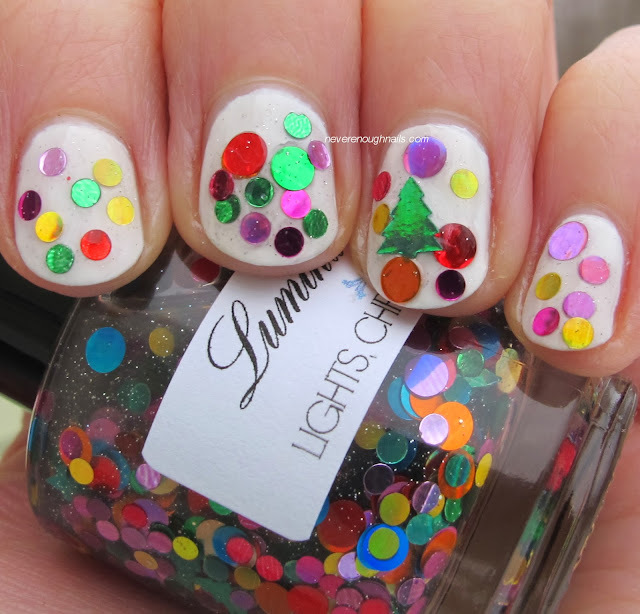 First up is Lumina Lacquer Lights, Christmas, Action. 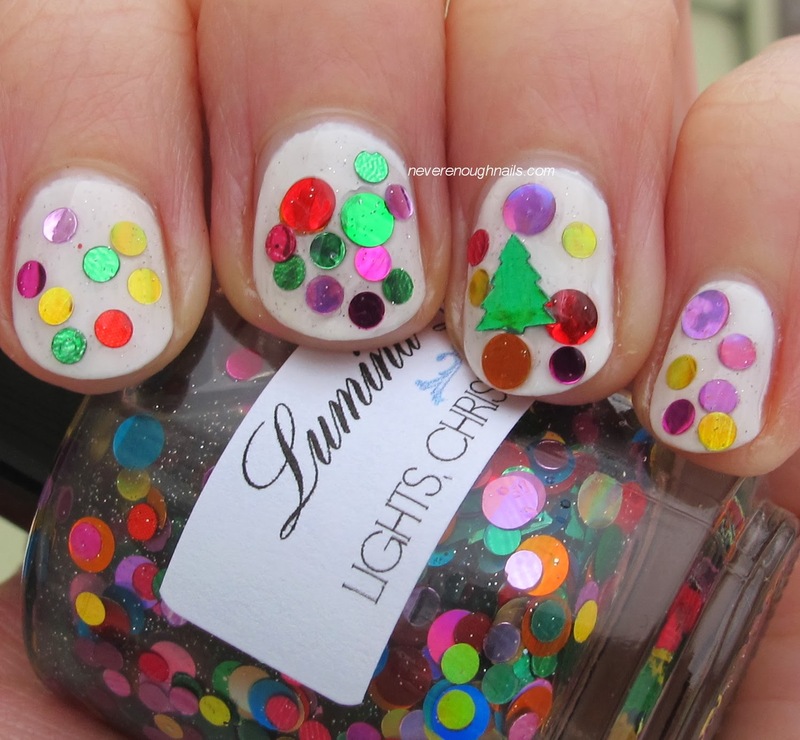 Lights, Christmas, Action is a mix of many different colored round glitters in several sizes and holo green Christmas tree glitter, all in a clear shimmered base. 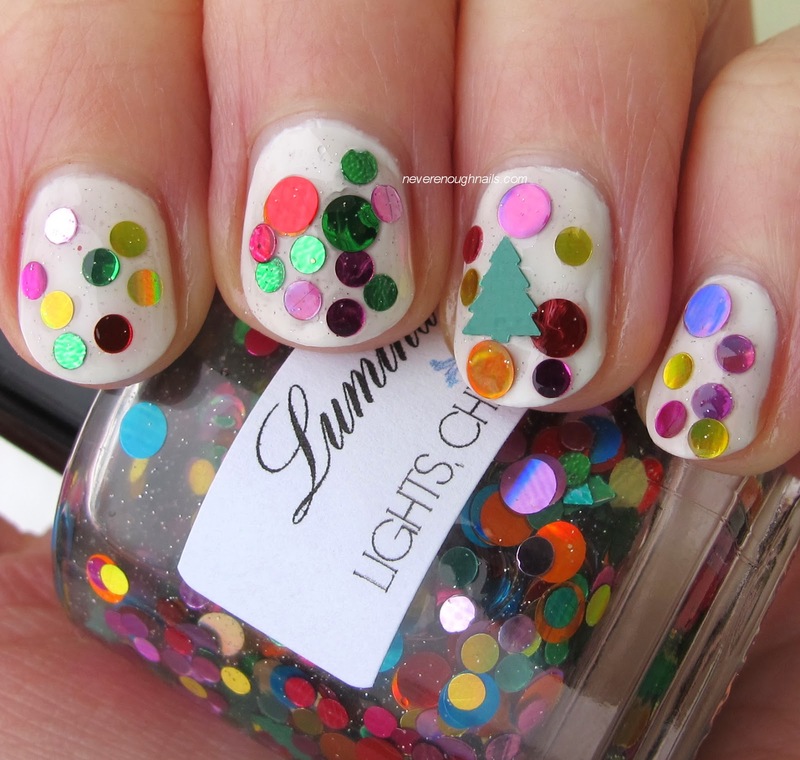 I have been dying for one of these round glitter polishes, they are so cool! 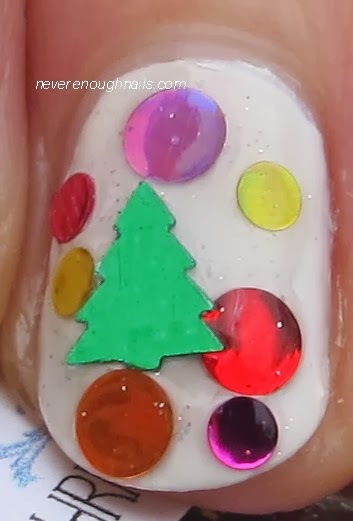 The mix of colors in this polish remind me exactly of ornaments on a tree. I wanted all the different color glitters to pop, so I layered this over two coats of OPI Alpine Snow. It was easiest to load up the brush with glitter, then wipe most of it off onto the neck of the bottle and take it right from the bottle neck to your nail. Tatiana recommends dabbing her polishes on and I normally find that to be the best method, but I think the base of this one is a little thick for dabbing. I just kept applying glitter until I was satisfied, so this isn't really a particular number of coats. Lights, Christmas, Action comes with a bag of extra Christmas tree glitter so you don't have to fish for them if you don't want to! Lumina Lacquer The Snow King is quite possibly my favorite winter-themed polish EVER. Now, I think I might be a little biased because it just happens to contain my favorite color combination, purple and gold, a lot of the glitter is holo (we all know I love that) AND it has my new favorite circle glitter. There are a couple different shades of purple in here, along with gold and silver. 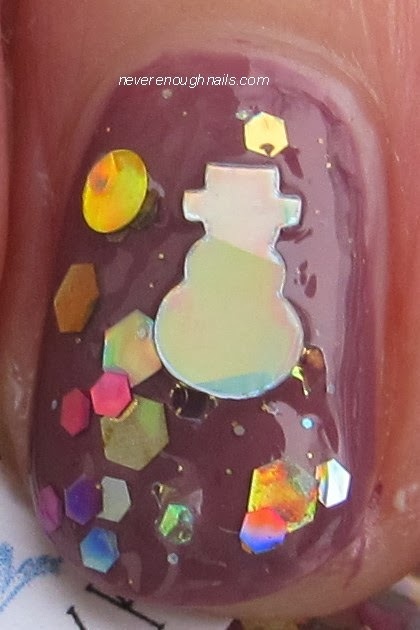 There are also holo silver snowflakes and snowmen! 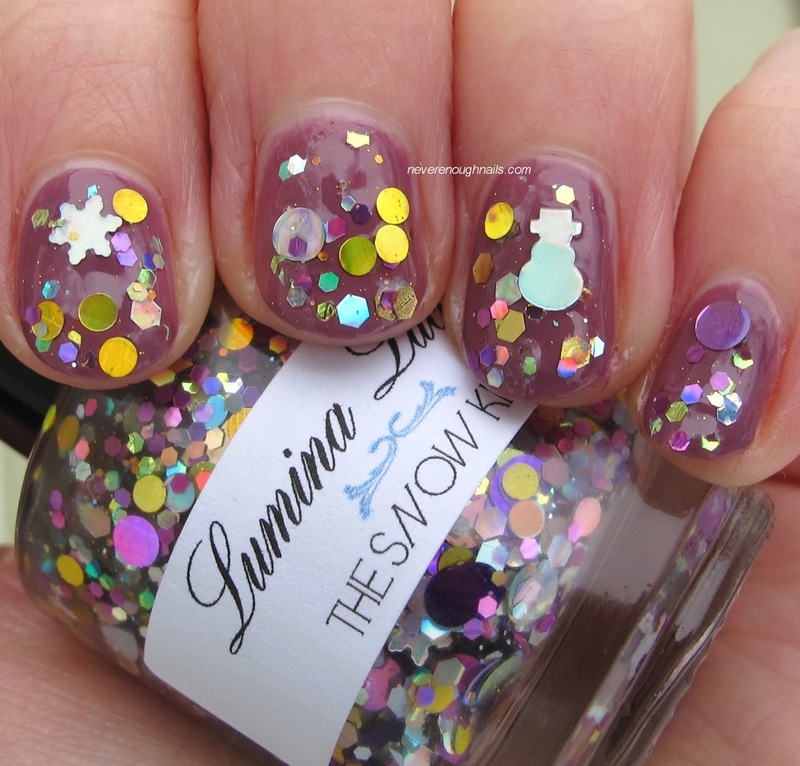 You get an extra bag of glitter with this polish too, with a ton of snowmen and snowflakes. Without the snowflakes and snowmen, I would and will wear this polish year round. I also like that it's an alternative to red and green that still looks really festive. I decided to layer one dabbed coat of The Snow King over two coats of my new favorite purple creme, Zoya Odette. The Snow King was easier to apply than Lights, Christmas, Action. I had no trouble dabbing it on and getting plenty of glitter on the brush. Lumina Lacquer's store is supposed to be restocked today! I don't know what time, but I would keep an eye out on Lumina Lacquer's Facebook and Big Cartel store for details. I usually find out restock times on Instagram, so you can follow @luminalacquer there. These are both really pretty! I've never tried this brand before, but now I want to.